Stress is a fact of life in the modern world and we all need coping tools to help us manage it better so we can stay happy and healthy. Chronic stress that is not well managed can cause depression, anxiety, and a host of health problems like obesity, diabetes, autoimmune diseases, vulnerability to colds and flu, and heart disease. 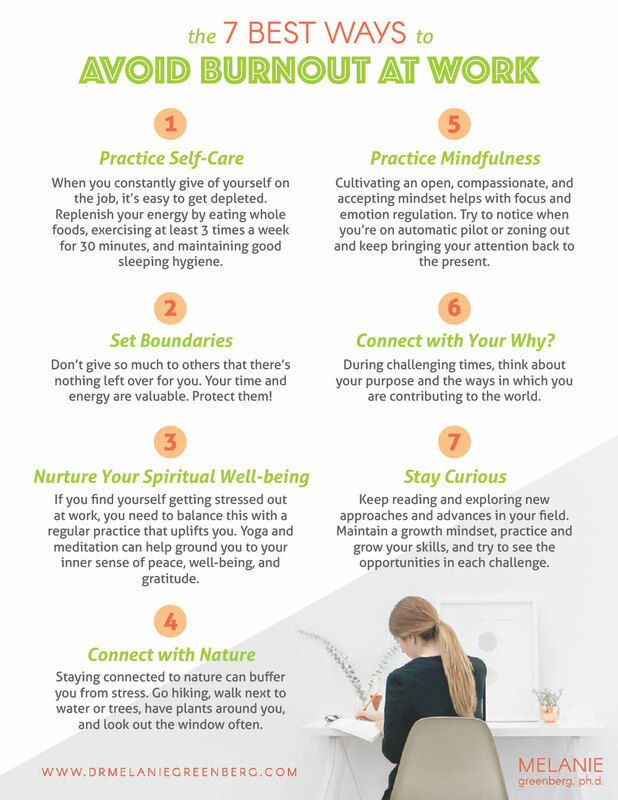 Below are 7 tips based on research and clinical knowledge that can really work to help you become stress-proof (or at least adept at managing your stress)! When you are stressed or anxious, your brain can get ahead of you, thinking about all the negative possibilities for life if things don’t turn out the way you want. You may think about not getting into college, not getting a job, or being fired from your job, not finding the right partner, or getting divorced, and so on. It’s really important to take a step back and ask yourself what specific thing you’re anxious about today. Then focus just on that specific stressor and what are the next steps you need to take to cope. When you get stressed, your body goes into a “fight or flight response” as your heart rate speeds up, the stress hormone cortisol surges through your body, glucose and adrenalin surge through your brain and your body readies itself for doing battle or running away. The types of stressors our ancestors faced tended to be marauding lions and tigers, so these were appropriate responses at the time. But today they can get you off-track if the stressor you’re dealing with is a chronic situation or one that requires careful thought. Taking slow, steady, rhythmic breaths (about 6 breaths per minute) helps your parasympathetic nervous system put the brakes on “fight or flight” and calm down as your brain and body start to perceive safety. Feelings of anxiety and stress can narrow your focus of attention onto the stressful situation so it’s all you can think about. Your mind keeps worrying and ruminating about what grade you may get, what college you’ll get into, or the mean comment somebody made. It’s important to interrupt these unproductive worry cycles that drain your energy without helping you solve the problem. When you find yourself ruminating, get up and get active, read a book or watch a movie, do an organizational task or call a friend. It’s not so important what you do, but it is important that you don’t sit and ruminate and work yourself into a depression or panic. Not all stress is bad for you. Stress that you have the ability to master can make you feel motivated and energized. Some stressors help you to grow as a person, learn new skills, find new resources, or develop new appreciation for what you have. Other types of challenges can build your confidence as you start to see yourself as a person who can cope with difficult situations or perform well under pressure. In one study, students giving a speech who were told to think of their body’s anxiety responses as signs of excitement performed better than those who were told to calm down. The definition of mindfulness is deliberately focusing with openness and acceptance on your inner experience. You stop rushing around on automatic pilot and take the time to see the colors, hear the music, feel engaged in your work, savor the happiness you feel in the presence of a trusted friend, or notice your stress building. If you can catch your stress early and stop to breathe, it’s less likely to turn into a migraine headache or sore shoulders. If you can learn to just sit with negative feelings like sadness and anxiety, rather than shoving them down, they will pass through quicker. If you hear your body’s signals that it needs a break, you are less likely to get exhausted at the end of the day. Your thoughts are just guesses, judgments, or predictions about what might happen. They aren’t necessarily true or even helpful. Stress and anxiety can create patterns of negative thinking that are overblown or too black and white. Don’t assume that nobody likes you or that you will do poorly, just because you think it. Put on an observer hat and look for objective evidence to determine if your thought is correct. Are there any situations in which the opposite happened to what you predicted? Are you well-prepared? Did you do well the last time? Even if a thought is true, it’s not always helpful to listen to it. So learn to watch your thoughts and decide which ones to pay attention to and which to ignore. Hello, I have your audio book and I love it. I am a health coach and I am doing some group coaching on managing stress. 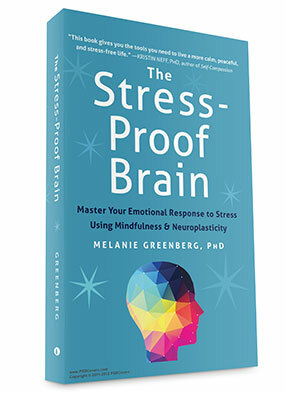 When listening to the book I don’t have access to your worksheets, which I would love to be able to use in helping clients evaluate their stress. Is there a way for audible users to access a pdf format of your book? Thanks so much! I love exercise as a stress management tool!